In recent weeks astonishing rumors have been spreading fast in science circles, and soon the wider public will be in the know. According to these rumors, despite all the denial and ridicule, planet Nibiru is real.This rogue object was there all the time. Right under our eyes. Since the days of Galileo we are aware of its existence. Initially it was mistaken for a star, and later for a solar system planet. It's neither. We currently know Nibiru as Neptune, allegedly the ninth planet. It simply isn't. You could call it the 8.5th planet: a massive object disguising itself as a planet in-between the 8th and 9th stable planetary orbits. Astronomers now refer to Neptune as a WIMP, a Wandering Immensely Massive Planetoid. WIMPs are dark objects that appear to be abundant in the universe and make up most of its mass. They wander from planetary system to planetary system, leaving a trail of havoc. The breaking news is that our solar WIMP, aka Nibiru, aka Planet-X, aka Neptune, is behaving according to the Mayan and Nostradamian prophecies. It is leaving its unstable orbit and will soon be on its way to Earth. Large-scale computations by a NASA team headed by Dr. Nancy Lieder have revealed that this WIMP weighing in at 17 times Earth, will approach our planet at the end-date of the Mesoamerican Long Count calendar, December this year. Given the five months notification, there is plenty of time to hide for the impending global tsunami that is said to be caused by Nibiru. Those who own a sea worthy vessel just need to stock up food and water for several weeks and leave the harbor well in advance of December 21st. Those who don't poses a ship that can roam the oceans can preorder here a Joint Escape Sea Unit System II. 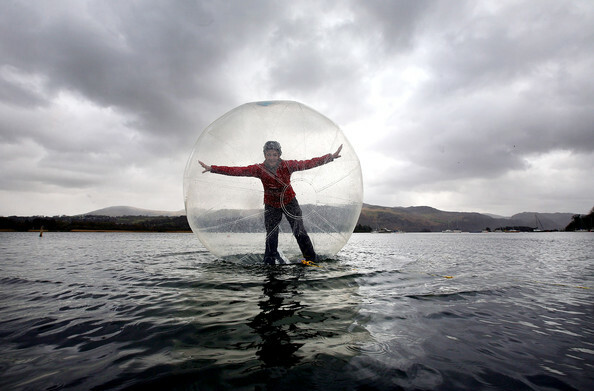 These transparent spherical units are designed to survive tsunamis.They allow the user to walk over water out into the open sea, and to walk back to shore when the tsunami is over. Thanks to their unique closed construction and graphene-reinforced materials used, these spheres can withstand water pressures that can be expected to occur when inadvertently the sphere gets too close to shore and temporarily is covered in wall of water. One unit can accommodate a single person of up to 210 lbs. Mappes, D. (2011). An Overview and Analysis of Apocalyptic Views Relating to the Year 2012 as the End of the World. Journal Of Ministry & Theology, 15(1), 129-155. There is proof all over the place that she's nothing more than an attention seeker profiteering on doomsday stuff. I personally hate the belief that the world is going to end this December. They said it was supposed to happen a bunch of times and then when it doesn't they just postpone it again. The whole idea of the Mayan calendar saying our world is going to end is ridiculous, because they couldn't even predict their own death. Also back then the Mayans didn't account for leap years, so if we added up all the ones they missed it'd be way past December 21, 2012, so technically this date already happened and were still here. This was a very interesting yet terrifying post. I personally think that the 2012 hubbub is simply just that; just another crazy thing that invokes fear and adrenaline rushes within society. This whole post about the planet Nibiru is very interesting; I have never even heard of it before! Enjoyed reading this post! What will all those people that weigh over 210 lbs do? I think that the company that markets the Joint Escape Sea Unit System II should devise an extra-large version for the larger members in society.